This full color 34-page softcover children’s book follows a girl in Brooklyn whose mom challenges her to plant a garden in their city backyard, with only a little piece of sun shining above the buildings. It’s a sweet story perfect for 2nd to 4th graders, or for reading out loud to younger children. You can see some of my illustrations on my blog here. To purchase a copy of The Upside-Down Gardener, click the button below to go to an order page where you can pay by either credit card or Paypal. The book is $10 and will be mailed within 3 business days. Click HERE to go to my Etsy page for easy online ordering. In this full color 32-page softcover children’s book you’ll meet the first member of The Poodle Posse, Woody, and his sweet owner, Mrs. Flout. Woody longs to have a brother and in looking outdoors he finds various little creatures, but none of them seems just right. Will he ever find a brother to play Hide-the-Bone with? This is a fun story for children learning to read, or as a read aloud story to little ones. You can see some of my illustrations on my blog here. To purchase a copy of Once upon a Poodle, click the button below to go to an order page where you can pay by either credit card or Paypal. The book is $10 and will be mailed within 3 business days. Fantasy Tales is a full-color soft-cover publication, 60 pages, which features illustrations by members of Bucks County Illustrators Society. The book contains the 19 color illustrations that our artists created as well as the stories, or excerpts from stories, that inspired the artwork. Fantasy Tales includes my Pied Piper illustration as well as work by James Bennett, Deb Hoeffner, Gil Cohen, Dot Bunn, Joe DeVito, Ponder Goembel, Rich Harrington,Monika Hinterwaldner, Becca Klein, Glenn Zimmer, Marie Thresher, Joe Kulka, Rebecca Rhodin, Pam Hamilton, Sandy Bender, Kim Kurki, Seth Robinson and Kathryn Maxwell. To buy a copy of Fantasy Tales, click the button below to go to an order page where you can pay by either credit card or Paypal. The book is $10, plus $2 postage, total of $12 (postage for inside US only). Your book will be mailed within 3 business days. If you live in the central Bucks County area and wish to pick up a copy from me, just email me and we can skip the postage charge. Full color 32-page soft-cover children’s book, illustrating the history and fun things for kids to do in New Hope, Pa. written by Gayle Goodman and Roy Ziegler, illustrated by Pat Achilles. To buy a copy of Let’s Visit New Hope, click on the button below to pay by PayPal or credit card. $10.00. Book will be mailed within 1 business day. 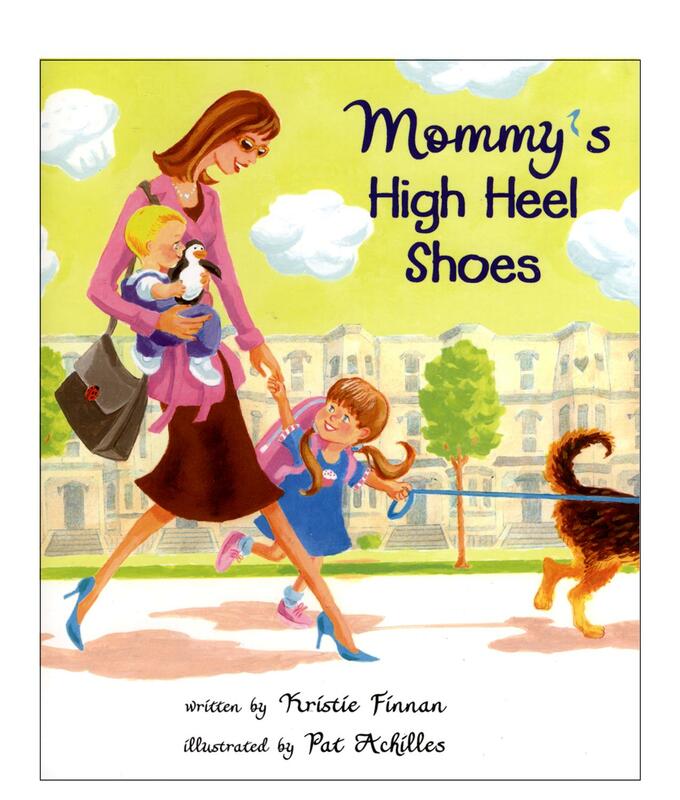 Mommy’s High Heel Shoes, by Kristie Finnan, illustrated by Pat Achilles. This is a delightful story by author Kristie Finnan in a 32-page hard cover book with dust jacket. In the story, after Mommy leaves for work, daughter Katie plays with all the shoes in her closet, remembering the fun things she does with Mommy with each pair. The story celebrates a working mother’s relationship with her children, and includes hidden pictures on each page. A great book to read aloud to toddlers of working moms, and fun for beginning readers to read and find the hidden cupcake, heart and ladybug in each illustration. Hardback, $18.00 including postage. Click on the BUY button to the right of the image to order the book through Paypal or credit card. The Lion, the Ostrich and the Squirrel, illustrated by Pat Achilles. 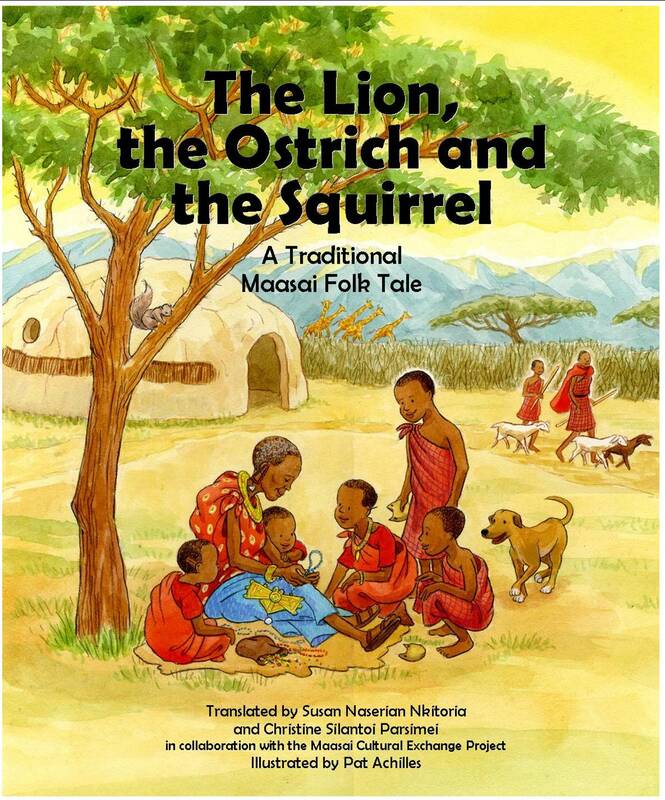 This book tells a traditional Maasai folk tale of a cunning lion, a brave ostrich and a quick-witted squirrel in a softcover coloring book, illustrated by Pat Achilles and produced by the Maasai Cultural Exchange Project. The book is $10 plus postage, and all proceeds from this book go to MCEP, which builds wells in Kenya and sponsors the education of Maasai women and children. I don’t sell this book directly but you can find information on ordering it from the Maasai Cultural Exchange Project website here. Below are some of the greeting cards and prints that I have illustrated, available for online purchase. I also invite you to visit my Zazzle online store, where I have a number of products, including t-shirts,sweatshirts, cards and mugs, all imprinted with my artwork – just click here to browse that store. If you see an item on the Zazzle store that you’d like, but would it customized in some way – for instance, you’d like me to hand-letter a special message below the art – just write me through my Contact page on this site, and for a small fee I will make it to your specification. 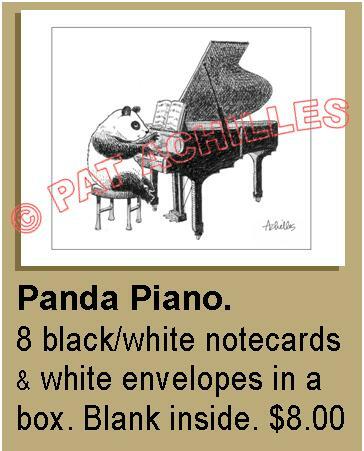 These Panda Piano Notecards are a favorite gift for music and piano teachers, or to use for thank-you notes to musical friends. Like all my cards, they are printed on partially recycled paper and in the USA. Click on the button to order through Paypal or credit card. 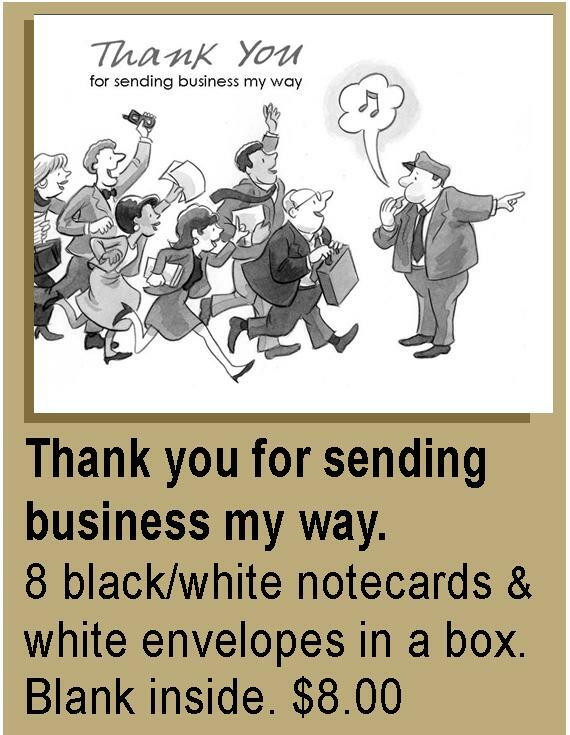 I’ve used these “Thank you for sending business my way” notecards for years with my own business, as do some of my small-business clients. My customers have commented that they are a fun and unique notecard to thank colleagues for referring your business. Click on the button to order online. 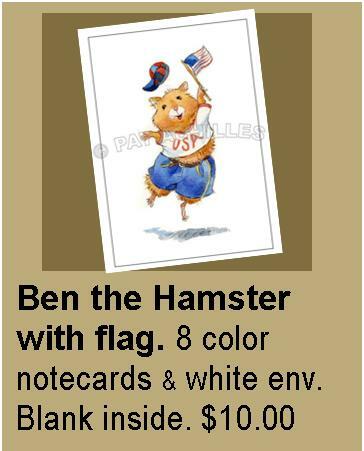 My full color notecard with a happily patriotic little hamster is a nice way to send a birthday wish or an uplifting note to friends who are proud to be an American. (And yes, each card is printed in the USA.) Click on the button to order through Paypal or credit card. 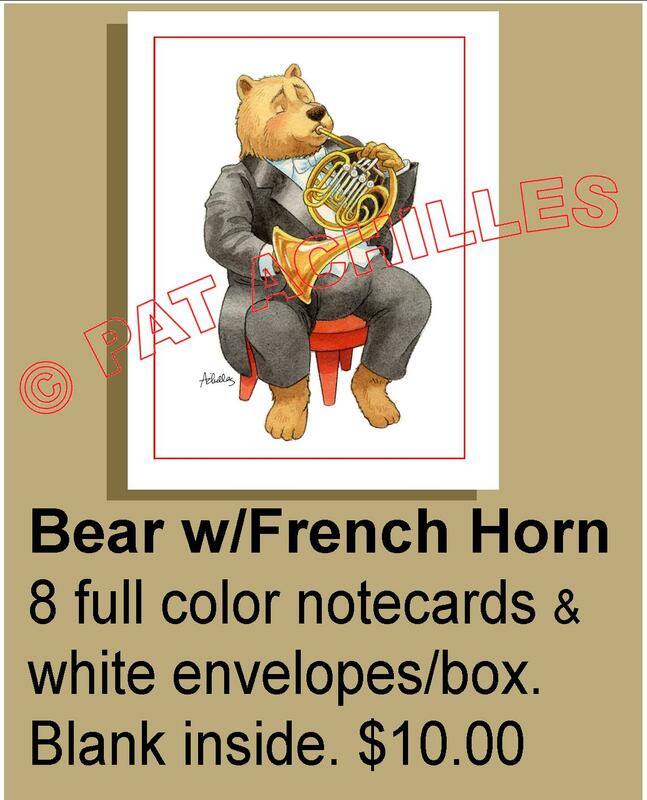 Another one of my notecards that are popular with orchestra and band members, this is my bear playing the French horn. Click on the image to see it larger. This card makes a jolly thank-you note or gift for a band director. Click on the button to order through Paypal or credit card. And one for the strings section, of course! 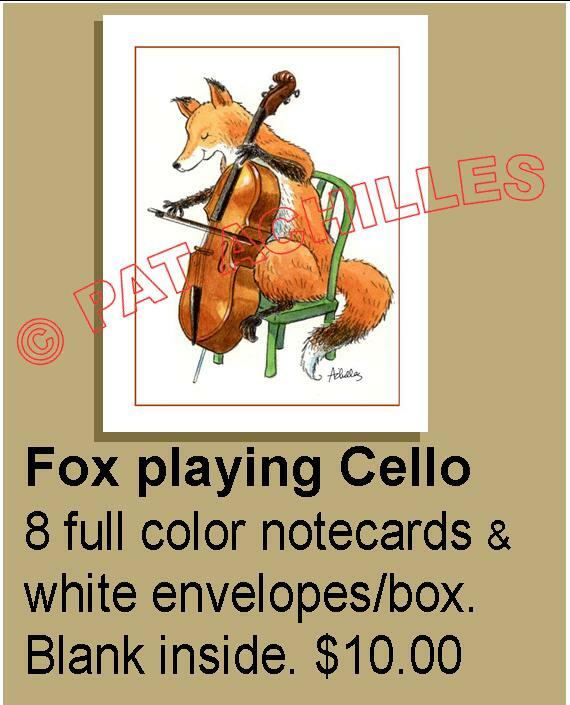 My fox playing a cello is another of my musical instrument-playing animals, inspired by the posters I draw for the Lenape Chamber Ensemble’s Children’s Concerts. Click on the image to see it larger, and on the button to order through Paypal or credit card. Click on the image below to enlarge. To order, click on the button near the image. All prints are printed on partially recycled paper in the USA. Matted Piano Panda Print. My black & white panda playing the piano stands out beautifully in a cherry red mat. The mat is included; it fits into a standard 11″ x 14″ frame. Cost is $13 plus $2 postage, total of $15.00. Click on the button here to buy. The Secret Garden, full color print, suitable for 8″ x 10″ window mat. (Mat not included). 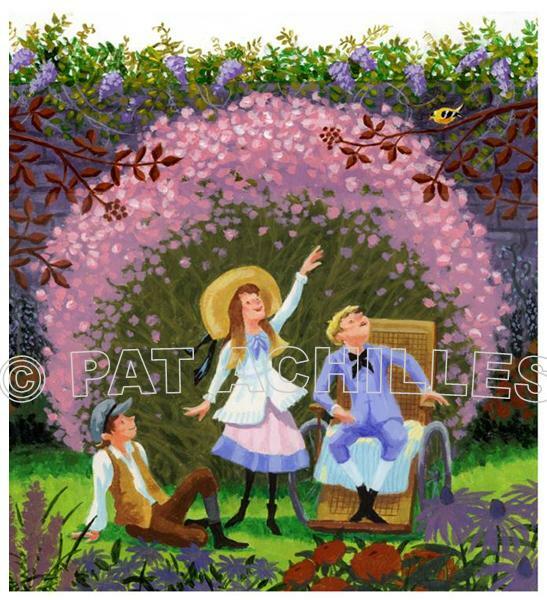 Inspired by the classic children’s story by Frances Hodgson Burnett, this illustration depicts the three children of the story – Mary, Dickon and Colin – as they delight in the beauty of the secret garden they have restored to its prime. $30 unmatted, includes postage. All images on this website are copyright (c) Pat Achilles. They may not be used without the consent of the artist. All properties such as book titles and text are copyright their respective owners. For permission, licensing or commission fees, please write me via my Contact page.